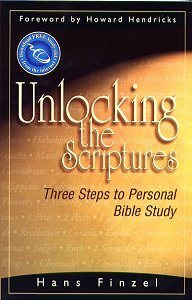 This updated classic leads the reader through the inductive Bible study process, showing practically how to study the Bible for one's self. With this tool, Christians can learn to relevantly apply God's Word to their lives as His Spirit leads them personally, rather than as some other leader might direct. Originally published in 1986, Finzel's style remains very accessible—providing practical examples that walk the reader through the steps of unpacking Scripture, using actual passages to practice.